The truth is, Gina sensed God calling us to missions long before me, and I became very skilled at diverting the subject whenever she brought it up. My favorite technique was to patronize her by implying that she was naive and hadn't counted the cost of foreign missions. Gina is definitely not a "bugs, snakes, and mud-hut" sort of girl, so it was helpful to inject those images into the conversation as soon as possible. Truth be known, I had no intentions of entertaining the idea of serving as a missionary outside the U.S.
Not long after moving to Asheboro, God opened the door for us to purchase the sort of home we'd always wanted. The house wasn't especially big, but it was private and sat on 4.5 wooded acres out in the County. There was plenty of room for our boys to run, we had a couple of big dogs, and when the leaves were on the trees, we couldn't even see our closest neighbors. For an introvert like me, it felt like a taste of things to come in glory, and we imagined being happy there for the long haul. The house's one drawback was that it had three floors. The children's bedrooms were upstairs, and the washing machine was in the basement. Given the ages of our boys and the prolific amount of laundry, Gina climbed stairs all day long...and her knees started to bother her. In 2007 we realized we needed to move. It's hard to remember exactly how the Holy Spirit got the drop on us. Of course, we were praying about a new house - which is to say we were asking God to provide a similar house with fewer burdensome steps. Then, at some point, one of us injected a new idea into the mix. Maybe we should ask God where HE wanted us move instead of telling Him where WE wanted to move. At the time, that seemed very spiritual and rather harmless, so we went with it. As we prayed in that way, our priorities began to change, and we grew convinced that we should be looking for a house in the city(*) rather than the country. Probably, this doesn't sound like a big deal to most of you, but it was huge shift for us. And like God loves to do, He used that seemingly insignificant course adjustment to lead us in a drastically different direction for the future. To make a long story short, we settled on a house in town. It was overgrown and run down – a real project. Our "dream house" wasn't hard to sell, and we accepted an offer less than 12 hours after putting it on the market! We had to find a home for one of our two dogs, because we no longer had space for two big animals - and the boys complained about losing the woods. But the move was a great experience for our family. We didn't have many close friends out in the country. Our neighbors were all very nice and had values similar to our own. They were glad to help out if you were in a bind, but (like us) they valued their privacy - that's why we all chose to live out there. If we volunteered to help with an event at the boys' elementary school, they were happy to put us to work...but there were plenty of people available to help and the needs weren't all that great. By contrast, our home on Holly Street is only a few blocks from Donna Lee Loflin Elementary School. I walk to school with my boys every morning, and we always stop to talk to someone along the way. There are a lot of needs in the school and community, and teachers celebrate when parents offer to help. We know our neighbors and count them as good friends. They're ready to help if we need it, but they also stop mowing the lawn to talk about life. Things are louder here than out in the country, and they're certainly not private. But we regularly interact with people who look and think differently from us. People want to interact with one another, so there are more opportunities to build friendships, to serve, and to share the Good News of Jesus than we ever experienced in the privacy of our previous home. We've come to realize that this move wasn't an end in itself. Rather, it's been an intermediate step in God's larger purpose for our lives. Instead of finding ourselves "satisfied" with life on Holly Street, the move here has only served to whet our appetites for more. Living on Holly Street has led us to ask this question: "If Gospel-opportunities have increased after a simple move into the city, what if we moved to a place where the need for the Gospel is even greater?" Asheboro is full of people who need to hear the Good News of Christ, but there also are a lot of Christians here. Statistically there's a church in our county for every 400 residents! What if we were to move to a place like Nagoya where less than 0.5% of the population knows Jesus and where there's only one Christian church for every 22,000 people? What if we relocated and lived the remainder of our lives among the largest unreached people group on the globe? I wonder how Gospel opportunities would increase just based on our new zip code (assuming they have those in Japan)! (*) - city is used here in the loosest possible sense. Yes, I'm referring to Asheboro, NC rather than New York (or Nagoya)! God used a move into a city with a small "c" as a stepping stone to a city with a big "C". 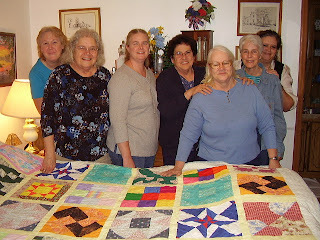 The "Sew Busy Ladies" are still at it! A year ago, I wrote an article about a sewing group here in Asheboro that was using their talents to support Christian missions in the community and around the world. The group meets at the home of our friend, Emily, who founded the group. Besides loving our family really well, The Sew Busy Ladies are supplying blankets to several crisis pregnancy centers and shelters, they've made countless dresses for little girls in a poverty-stricken country in Africa, and they've recently sent a shipment of items to some MTW missionaries in Haiti. Just like our friend Mary Spaar who founded "Gnomes 4 Japan" in response to last year's tsunami, God is using this group of ladies (+ one notable gentleman) in marvelous ways to expand Christ's Kingdom and care for the poor and orphaned. A couple of weeks ago, Emily called to invite Gina and me to come by on a "sewing night" because the ladies had a surprise for us. 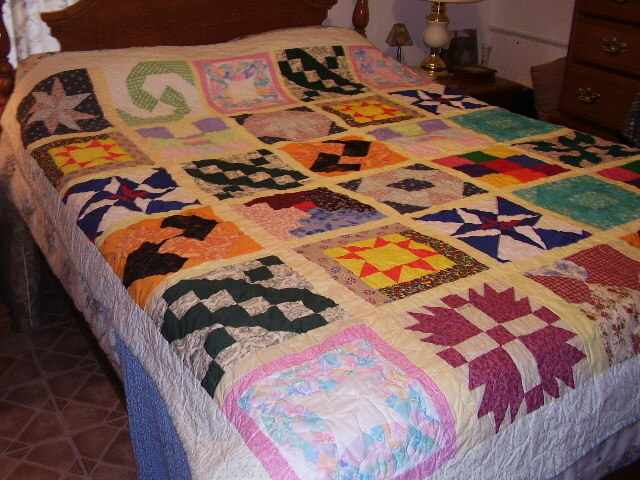 On that evening, they presented us with this beautiful quilt. Each group member made two of the squares on the quilt - and they even used a couple of Gina's squares that they somehow acquired! 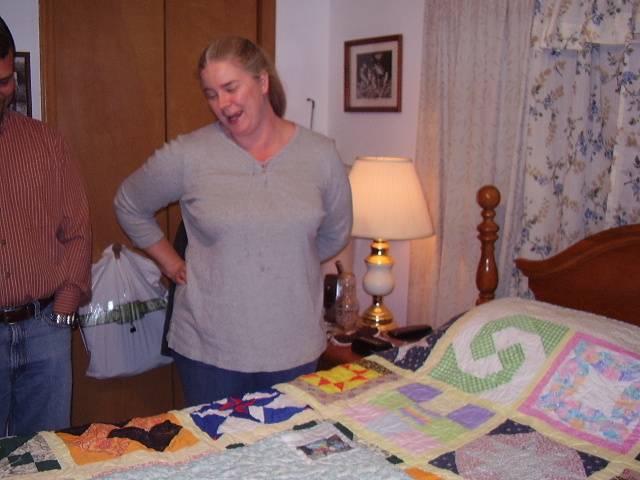 The quilt will have an honored place in our new home in Japan. Of course, we'll cherish it because of the friendship it represents, but it also reminds us that God loves to use ordinary, weak people to accomplish his purposes around the world - and that means there's hope that he'll use our family in some big ways, too! If you live near Asheboro and would like to get in touch with the Sew Busy Ladies, feel free to send me an email. They're always looking for new members, and previous sewing ability isn't required (they love to teach). They're also looking for some space that would allow them to expand their efforts. They'd be happy for you to ask God to provide that!